Techniques may include Swedish, deep tissue, sports massage, prenatal, myofascial release, and/or Craniosacral therapy. Your therapist will work with you to determine the techniques appropriate for your needs. All of our massages incorporate the healing benefits of aromatherapy through the use of our aromatherapy massage oils. Chair massage focuses on your back, shoulders, neck, arms, and hands. Chair massage is done over clothes and doesn’t require any massage oil. You are seated in a special chair with your face resting in a cradle while the therapist relieves muscle tension. Reiki is a Japanese technique for stress reduction and relaxation that also promotes healing. It is administered by “laying on hands” and is based on the idea that an unseen “life force energy” flows through us and is what causes us to be alive. If one’s “life force energy” is low, then we are more likely to get sick or feel stress, and if it is high, we are more capable of being happy and healthy. Reiki treats the whole person including body, emotions, mind and spirit creating many beneficial effects that include relaxation and feelings of peace, security and well being. Reflexology sessions consist of an initial assessment of the feet to screen for potential unseen problems, and then massage of the reflex points of the feet. All sessions will incorporate essential oils appropriate to each client and their particular health concerns. Reflexology is a very relaxing treatment, as the hundreds of nerve endings in the foot stimulate and soothe the entire body. It is also a recommended treatment for anyone suffering from foot and ankle problems, individuals with poor peripheral circulation, and anyone wishing to improve their energy level. 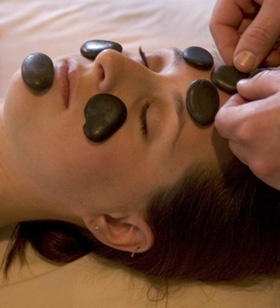 This session utilizes a combination of heat (warm towels infused with essential oils) and cold with chilled stones used in the massage technique. This wonderfully aromatic session is very relaxing and benefits sinus problems, headaches, and generalized tension in the face and scalp. 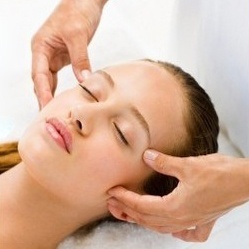 This is a massage technique and is not a “facial”. The technique used is a detailed massage therapy protocol that releases muscular adhesions, tones weak muscles, releases tension, increases circulation, lessens wrinkles, improves the complexion, aids in stress reduction and relaxation, and much more! It is recommended that this service be done in a series of six consecutive sessions to achieve the best results. This service utilizes our Invigorating Body Scrub, hot towels, and a sanitary paraffin wrap to alleviate joint pain and leave you with baby soft skin.